To teach the second amendment requires a bit of history. The United States law code is based heavily on English law since the bulk of Americans at the time of the Constitution’s writing were originally from England, were ruled by England, and lived under English law. The right to bear arms, or in modern language, the right to own and carry a weapon, including guns, goes back to English rights, first written down in the English Bill of Rights in 1689. Just prior to the English Bill of Rights being written and accepted as law there had been a power struggle between Catholics and Protestants and between the power of the monarch (or government) and the rights of the people. James II had tried to disarm the populace during all the trouble. But the English people claimed ancient rights, permanent rights, rights that could be neither granted nor rescinded by government. The English people and their rights prevailed and the American colonists inherited this sense of natural rights as pertaining to arms. 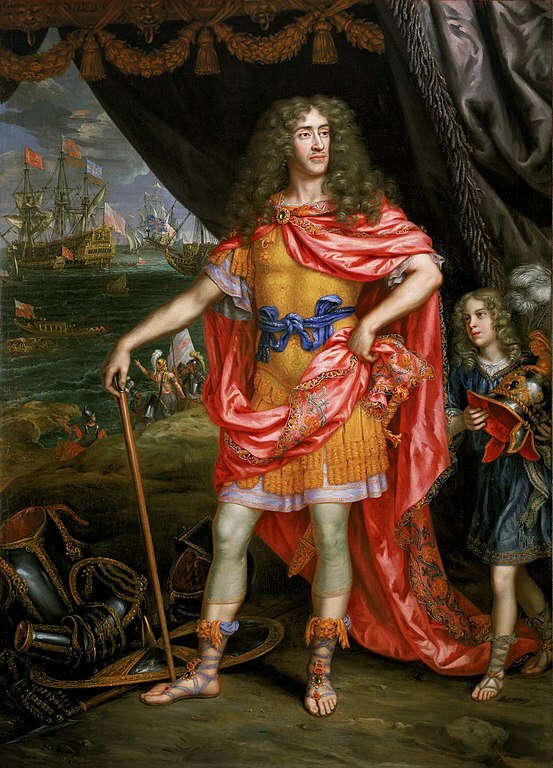 This is King James II of England dressed up like a Roman emperor. That’s basically how he thought of himself, a very powerful and absolute ruler. His subjects, however, did not agree. They thought they had some rights, like the right to defend themselves and their property. This painting is by Henri Gascar (1660s). Further, the American colonists had just fought an eight-year-long miserable and costly war to secure their natural rights from an English monarch who once again had tried to deprive them of their arms. The American founders understood the threat of an armed populace to government and they saw it as a check on government. Even more importantly the founders recognized the natural right to life and the corresponding right to protect one’s life and property against assault. That protection requires arms. 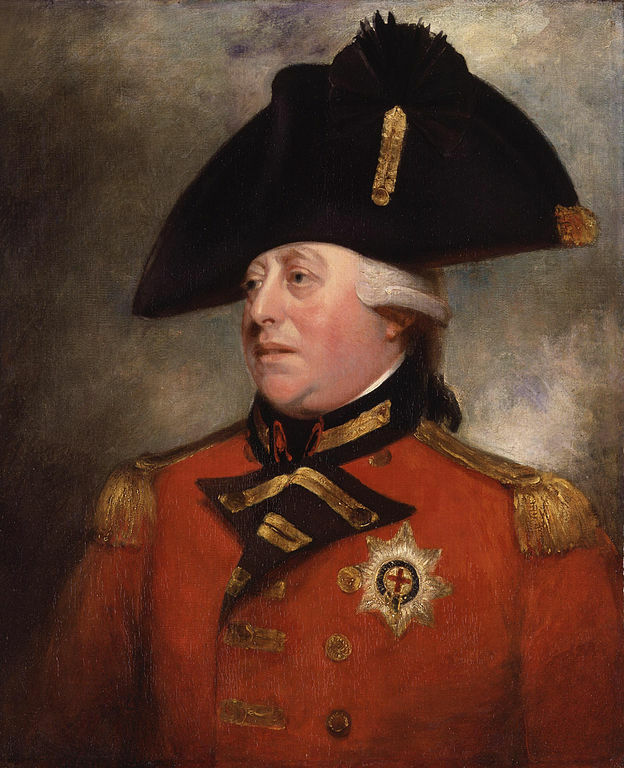 This is King George III. In 1774 his parliament with his encouragement signed the Intolerable Acts. When the colonists resisted the Acts with arms the British response was to disarm the colonists. This portrait is by Sir William Beechey. You can read more about the role of the Revolutionary War and King George in the adoption of the 2nd amendment here. militia: males between approximately sixteen and sixty were all required to be members of the militia in their communities. Virtually everyone owned and used guns. The few who didn’t were required to pay a fee in lieu of their military service to the community. The militia defended against Indian raids and insurrections, served as a police force when needed, and could be called upon for the defense of their state or of the United States when needed. free State: you can’t be free if you are powerless. bear arms: arms are weapons. The word doesn’t mean only guns, but it certainly includes guns, nor are specific types or categories of weapons listed. To bear means to physically carry. You can have arms on your person as well as in your home. shall not be infringed: notice that the document does not pretend to grant the right to bear arms, nor do any of the other rights listed in the Bill of Rights. Each of these rights are seen as natural or God-given rights. The second amendment merely reminds government, in ink, that they may not infringe on this right the people inherently posses. In today’s world fewer and fewer people actually own and use their own guns. What we don’t understand we fear. Discuss the right of the people to bear arms, why that right exists (to protect life and property), and some of the ways and reasons that the government tries to deprive the people of their arms. Talk about the responsibility of all citizens in the defense of our nation. We don’t all serve in the military or the police force, but we nevertheless have a responsibility for the security of our communities. How can you be a part of that security? How can you make your family and your neighborhood safer? Garrett is learning to shoot with a BB gun, which we have taught our children to treat like a real gun. Sometimes we take him on a range with a .22 rifle. When he is older he will learn to use other calibers of guns. Part of learning to use a gun is learning to respect the weapon and to respect life. Those lessons are best taught from a young age and in a secure environment. Then teach your kids about guns. You can start with BB guns in your backyard. Every time they go to shoot guns go back over the rules of respect. If you don’t know, then find someone who does. Then have them take a gun safety course from a certified instructor or take them out on a gun range with someone knowledgeable. Even a three-year-old should understand and respect guns and older kids should learn to load and fire a weapon. Gun safety isn’t just for people who own guns, it’s for everyone. Like everything in the Constitution, Second Amendment rights are politically charged. Read arguments for and against the right to bear arms. Decide for yourself what you believe. The Second Amendment often hits the news. Watch for it and discuss the news with your kids. Where I live, in Idaho, hunting is a big deal. Many people I know hunt venison and other big game to aid in feeding their families. Others kill predators to protect their farm animals. Both of these activities associated with guns are controversial too. What do you think and, more importantly, why? Discuss it with your kids. Ironically, England, the land which taught us our right to bear arms has banned guns. Even their police have no firearms, except under special circumstances. Of course criminals still have weapons. Recently when England was experiencing riots baseball bat sales went through the roof. What is the difference between a “right” granted by government and an inherent “Right” which can neither be granted nor rescinded? Some people argue that people should be allowed to have any arms, even missiles and so forth if they can afford them. Most people agree that some sort of regulation in use and possession of arms is warranted. But then of course we have to argue over the specifics ad infinitem. It’s a debate that will never end. Read quotes from the founders themselves about guns, laws regarding them, and the Second Amendment. Layers of Learning Unit 4-1 is all about American government. Check out our curriculum guide to learn more about the Layers of Learning curriculum. HI, i just stumbled onto your page. My children and i are going to being doing a unit study on Guns, gun safety, science behind guns, 2nd amendment… I’m searching for more materials! Any suggestions? That sounds like a great idea for a unit study! If you talk with a local gun range you might find someone willing to talk with your kids about gun safety and the science behind guns. One of the gun ranges near us does classes for parents and kids on a regular basis. I wish I knew about books for kids that discuss those things, but I think there is such fear about guns that the subject is taboo for kids. A good kids book would be “With my rifle by my side” by Kimberly Jo Simac. The English Bill of Rights was enacted in 1689 (not 1698 as stated), exactly 100 years before James Madison introduced The US Bill of Rights to Congress (1789). Technically the right to bear arms in England survives, but as you see, it says “as allowed by law”, which makes it no right at all. English constables never carried guns, even when the law allowed it for everyone else. They still prefer it that way. Pointing guns at villains and shouting a lot just isn’t their style. Originally, Madison proposed the 2nd amendment also guarantee the right NOT to bear arms. Congress disagreed. Thanks for catching our typo, Jon. We’ve updated the article to the correct info.